Tsai responds to Xi's remarks during a press conference on January 2. Chinese President Xi Jinping said on Wednesday Taiwan “must and will be” unified with China while reiterating the process would be “peaceful.” Xi was speaking one day after Taiwanese President Tsai Ing-wen unveiled a new framework for cross-strait relations. While the Chinese president did not renounce the possibility of using military force to achieve unification, he strayed away from overt threats and inflammatory language while implicitly rebutting the principles of Tsai’s “Four Musts.” Under this framework, debuted by the Taiwanese leader on Tuesday, China must recognize the existence of the Republic of China (ROC), the formal name for Taiwan’s government, while respecting the commitment of the 23 million people of Taiwan to democracy and freedom as precursors to cross-strait engagement. Tsai’s ruling Democratic Progressive Party (DPP), which favors the eventual independence of Taiwan, lost ground in November 2018’s regional elections as the opposition Kuomintang (KMT), which favors eventual reunification with China, swept to power in several key municipalities. While Tsai insisted on Tuesday that the DPP’s election losses were not caused by voter dissatisfaction with her cross-strait policies, Xi’s conciliatory tone may have been designed to appeal to new KMT mayors, who want to establish municipal-level ties with Chinese cities, and their supporters. In his speech, Xi reiterated his commitment to the so-called “1992 Consensus” as a cross-strait framework. KMT leaders overwhelmingly recognize this consensus, under which the ROC and the People’s Republic of China (PRC) agree there is “one China” while disagreeing over what that China consists of. The KMT generally interprets the consensus as maintaining the status quo rather than adopting a “one country, two systems” framework. Tsai and the DPP do not recognize the purported agreement, a stance she reiterated on Wednesday. Will Xi Play the Long Game With Taiwan? While Xi said China would make “no promise to renounce the use of force,” he often reiterated the notion that it is “willing to create broad space for peaceful reunification,” indicating that Beijing may take a long-term approach as Tsai faces a tough re-election battle. “Compatriots on both sides of the strait are a family,” Xi added. Taiwanese politicians and analysts have long alleged the existence of a Chinese campaign of interference in Taiwan’s politics – fears which were amplified during and after Taiwan’s November 24, 2018 regional elections – but the exact source, scope, and impact of any organized Chinese meddling remains unknown. In Xi’s speech, which came on the 40th anniversary of a 1979 Chinese Communist Party (CCP) policy statement titled “Message to Compatriots in Taiwan,” he called the integration of Taiwan and China a “historical conclusion drawn over the 70 years of the development of cross-strait relations” but offered few new specifics. He did mention the historical completion of the “Three Links” between Taiwan and China and expressed a wish that the outlying ROC islands of Kinmen and Matsu be connected by bridge to China – an idea touted in the past by Kinmen politicians. But Xi’s vision of unification with China has little support within Taiwan. According to an August study by National Chengchi University, just 3 percent of respondents wish to unify with China “as soon as possible,” while an additional 12.5 percent want to maintain the status quo while moving toward unification. 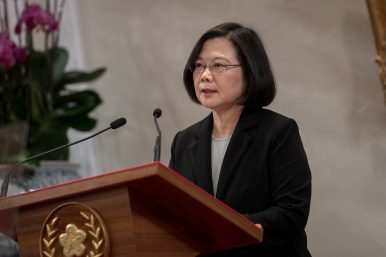 Tsai responded to Xi by explicitly stating her framework of “Four Musts”: Along with recognizing the ROC’s existence and the commitment of its citizenry to democratic values, Tsai said cross-strait disputes must be handled “on a basis of equality” and government or government-authorized representatives must be present for any negotiations between the two sides. In her Tuesday speech, Tsai also laid out a three-part security network for cross-strait exchanges: protecting democracy, enhancing cybersecurity to thwart threats of cyberattacks or disinformation, and securing people’s livelihoods, to which she cited Taiwan’s response to the spread of African swine fever within China.